Harry Collier did more than just play football for Collingwood in the 1920s and ’30s; on more than a few occasions he even recruited players to the club. Cyril Kent was one such player. Kent had been playing for Brunswick in the VFA while working with the Vacuum City Oil Company. One weekend the Brunswick team enjoyed a trip away, but unfortunately the bus broke down on the return. Kent could not make it back for work in time on the Monday morning and he was sacked – in what appeared to be a crippling blow for the young man, as the onset of the Depression began to stifle employment opportunities. When Collier found out about his acquaintance’s plight, he fixed Kent up with a job – and a new football team. Collier worked at the Victoria Brewery and found Kent a position there, which he would retain for the rest of his days. Collier went further and encouraged Kent to “have a run” with the local brewery team and the Collingwood District team, playing under the tutelage of its coach, Hugh Thomas. A grateful Kent took Collier up on both offers. Standing at 177cm and 65kg, Cyril Kent was a talented, durable footballer. Through the 1920s and ’30s he often played back-to-back games of football on Saturdays – with the brewery (complete with VB logos on the front of their jumpers) in the morning and with the Collingwood District side in the afternoons. 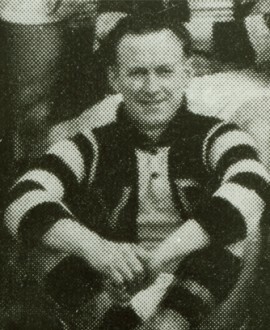 He impressed Collingwood enough to be selected for one senior game, in Round 5, 1928, when injuries hit the club hard for the match against St Kilda at the Junction Oval. History does not record much of any note from the game, other than the fact that Gordon Coventry kicked nine goals and the Magpies won by 28 points. Kent had been named in the back pocket, but played most of the game on the wing. According to the Sporting Globe, he was “very effective” on the day. But his performance was not enough to keep him in the team. Kent accepted his lot, as was his nature. An easygoing, well-liked gentleman, he was grateful to have earned his one chance to play for the famed Collingwood team. Kent would have considerably more success with the brewery side for the rest of his football career, leading them to two Premierships in 1934 and ’35, and being adjudged the best player in the ’34 Grand Final. Kent’s ability also saw him rise to become captain of Sandringham in the VFA. He continued to follow Collingwood’s fortunes for the rest of his life, forever grateful to his mate Harry Collier for his job, and for the chance to play VFL football.